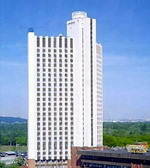 Located on the left bank of the Dniper river, tree-star "TOURIST" with 27 floors is the largest hotel in Kyiv. The hotel is 10 minutes from Kyiv's city center by metro. The station "Livoberezhna" is right outside the hotel, which is also close to the city's best parks and beaches. The city's best views with all of Kyiv's most famous landmarks clearly visible from our hotel, splendid views of the Dniper river and Kievsko-Pecherskaya Lavra church also. The restaurant of the hotel with wide assortment of dishes, soft and strong drinks where 400 visitors can be seated. Service top quality and inexpensive. Continental breakfast is included. Buffet breakfast is available, price is on request.